"The bird which made the breeze to blow" has the longest wingspan of any bird on the planet, wandering albatrosses live up to their name on long fishing trips of 10-20 days when they can cover 10,000 km using barely more energy than when they are sitting on the nest. Average Weight: 5.9 to 12.7 kg, commonly 6.4 - 11.9 kg, males are typically around 20% heavier than females. Immature birds have been reported at up to 16.1 kg shortly after leaving the nest due to still having fat reserves that sustained while on the nest waiting for the adults to return. More typically fledgling albatrosses are 1-2 kg heavier than the adult birds. Wingspan: average 3.1 m (10 ft 2 inches) and up to 3.5 m, these famously have the largest wingspan of any bird, larger but unverified sizes have been reported. Breeding Season: An unusual breeding system whereby one chick is produced every two years by pair of adults that mate for life, though around a third of pairs defer breeding beyond the one year gap. Adults return to colonies which are on sub-Antarctic islands amongst open vegetation on exposed ridges or small hills in November, eggs are laid in December and January on a nest that is a mound of vegetation held together with mud and hatch 11 weeks later. Estimated world population: - 26,000. Feeding & diet: The mainstay of the albatross diet is fish, squid and crustaceans which are caught at night at the sea surface or in shallow dives. They will also follow boats and ships of any type for discarded food especially fishing boats where fish offal from gutted and filleted fish may be thrown overboard. Conservation status: Vulnerable, many populations are in a long term decline as a result of losses from longline fisheries, the slow breeding rate of these long lived birds means they are slow to recover. Distribution: Circumpolar, usually stays in the sub-Antarctic region not venturing further south than about 60° S. 75% of the world breeding population is found in three places, South Georgia (25%), Prince Edwards Islands (40%), Crozet and Kerguelan Islands (10%). Non-breeding birds and juveniles usually spend their time north of 50° S, between there and the sub-tropics. What are Wandering Albatrosses like? The wandering albatross is a truly remarkable bird. South Georgia residents of the species have been known to make regular fishing trips that take them as far as the seas off Uruguay and southern Brazil. Round trips of thousands of kilometres over several days repeated frequently, and all to catch food for themselves and their young, these are birds that will fly 1,000 km for breakfast. Any visiting ship to the South Atlantic will almost certainly at some time be followed by one or more albatrosses, wheeling and turning around the ship, following at a distance hypnotically and silently. The bird in the picture to the right is a relative juvenile recognisable by the dark wing tips. As the bird ages, the dark patches recede further to the tips of the wings, so it becomes whiter. After leaving the nest they don't return again for 5 to 7 years when they return to the island where they were born. Albatrosses mate for life and can live to be over 60 years old probably making them the animal that travels further than any other in their life-time. The albatross is a large bird with a large chick. The chick is so large (12kg when it leaves the nest) that it takes just over 12 months to develop fully. This means that the albatross is in the same select group as king and emperor penguins in that it has a breeding cycle that stretches over 2 years. 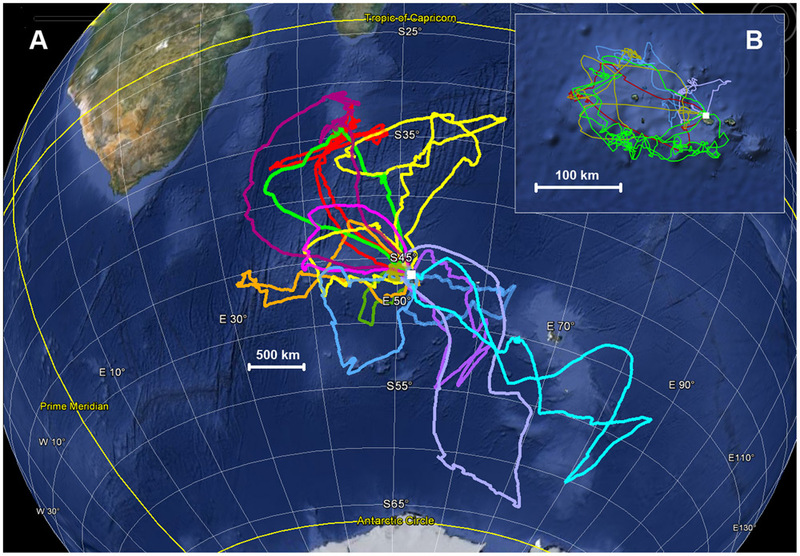 What sort of fliers are Wandering Albatrosses? There is a mechanism within the base of the wing to "lock" it in an extended position so the bird doesn't need to strain to keep its "arms" out. Albatrosses have many more "slow twitch" fibers in their flight muscles than do other birds which do the job of making continuous small adjustments to the wing during gliding flight rather than having fast twitch fibers for flapping flight. Albatross flight is achieved from a combination of the winds that blow around the southern ocean, those long thin high "aspect ratio" wings, an assemblage of muscles for constant fine tuning of the three dimensional attitude of the wings and an on board bird brain that controls those muscles while also being prepared to set out on journeys of a week or two that cover more distance than most birds in a year. Foraging paths of 40 incubating wandering albatrosses from Possession Island, Crozet archipelago (white square) in January - March 2011 measured by attaching 20g (0.2% of the birds weight) GPS trackers to the birds. The trips varied in length from 3.6 to 21.1 days and from 475 to 4,507 km. Grémillet et al. 2012. The down side of those wings and flight muscles is that taking off can be problematic, albatrosses favour windswept rises on which to build their nests which makes take off into the wind much easier. Real difficulties come when they are taking off from the surface of the sea in calm conditions, long runs are sometimes required to get up enough speed and enough air under those wings, the bird in the picture is shown doing such a thing. 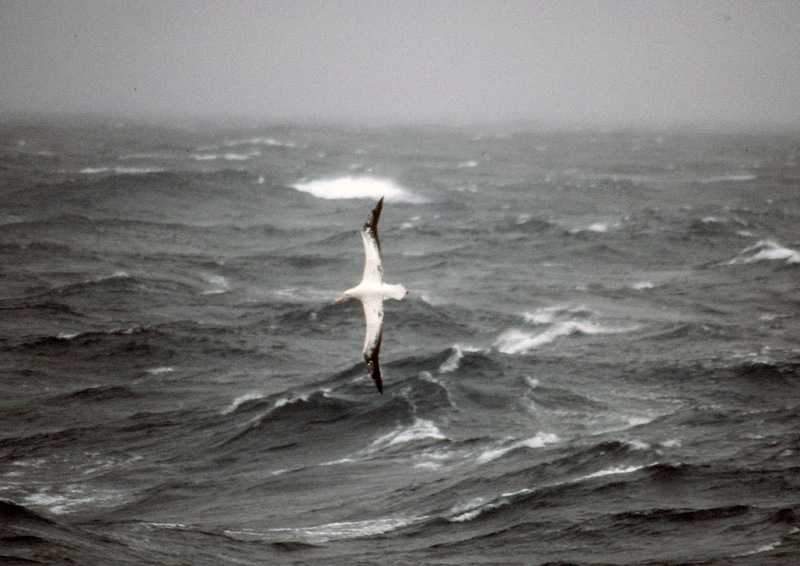 The reason for the difficult take off may be that the bird has gorged itself on too much food, especially if it has been feeding on carrion floating on the sea surface, in such conditions vomiting to lighten the load helps with take off again, wandering albatrosses can consume up to 3 kg of food at a single sitting, about 25% of their body mass. They do however often remain at the sea surface for several hours after a large meal while digestion takes place. 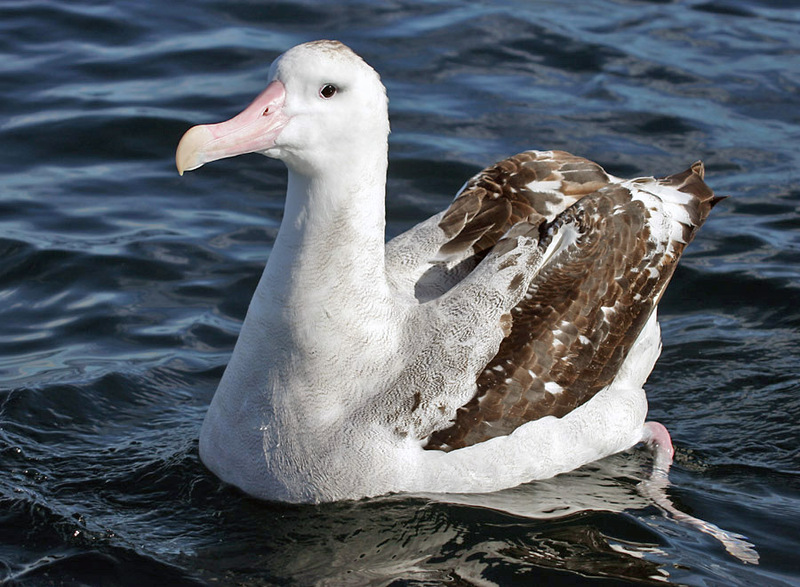 Wandering albatrosses have very acidic stomachs, more so than other seabirds and similar to carrion feeding vultures, this allows the birds to digest the food they find quickly, useful for a flying bird and also when feeding on carrion and fishery wastes from fishing boats. In folklore the bird carries the soul of dead mariners. If a sailor kills the bird, bad luck would fall upon him for the rest of his natural life. This was not a universal belief as the feet of the albatross were once used as tobacco pouches and the long hollow wing bones for the stems of pipes. In what way are Wandering Albatrosses threatened? Wandering albatrosses are the largest species of the group of albatrosses which comprises 22 species, of those 22 species, 15 are considered to be threatened with extinction and the other 7 "near threatened", of the 15, 3 species are "critically endangered". Populations have monitored since the 1960's and are in decline in many areas. They are all long lived species which begin breeding quite late in life (7 - 10 year old) and breed at a slow rate with a pair producing one fledged chick every 2 or 3 years. 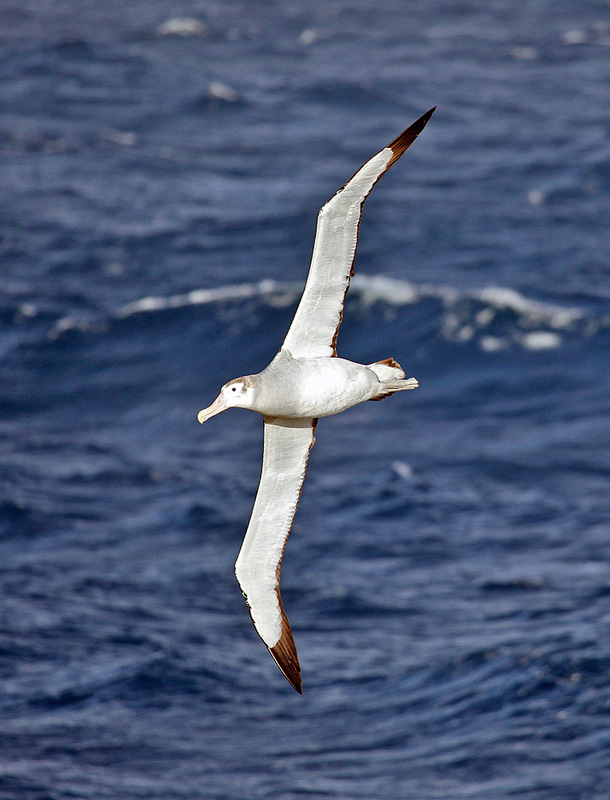 Small increases in the death rate can therefore have a serious effect on albatross populations. Currently about 100,000 albatrosses a year are being killed many of them accidentally by largely illegal long line fishing. The main hazard is from long line fishing, this is a method where long fishing lines are laid out at sea by boats, at intervals along the main line, there are shorter side-lines which terminate in a baited hook. The long line can carry hundreds or even thousands of hooks. It is laid out in the water column or to sink to the sea floor, left for a while and then pulled back up again. In itself it is a controversial technique in that it is indiscriminate and can catch and kill marine life that is not intended. 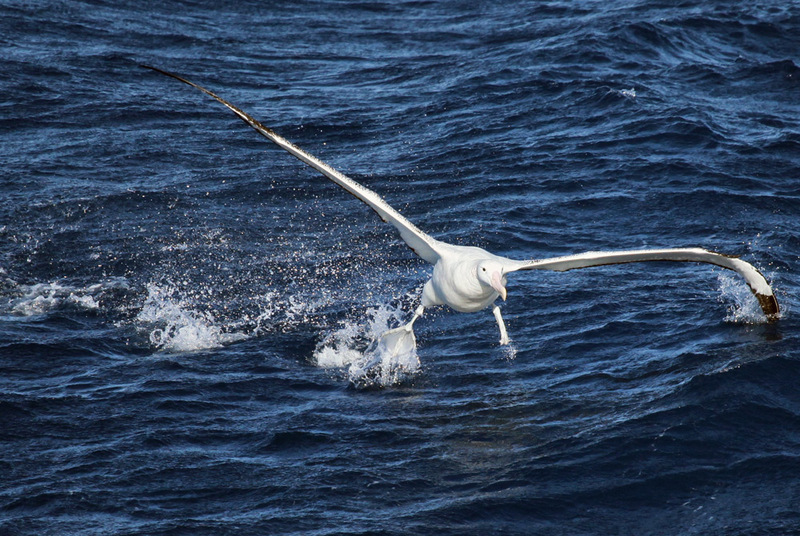 The danger for albatrosses is when the lines are being set, they are set out from the back of the boat and for a while are visible at or just beneath the surface, the albatrosses at this point come down attracted by the bait and become hooked, the descending line then drags them down beneath the water where they drown. Legal commercial fisheries are taking steps to combat these deaths such as by weighting the lines so they sink quickly while being set, by flying long streamers behind the boats while setting lines to deter the birds from coming close or by setting lines at night or from beneath the surface of the water. A continuing problem however is from illegal fisheries especially for the Patagonian Toothfish Dissostichus antarcticus sold commercial as Chilean Sea Bass or under a number of other names in high end restaurants, such boats are breaking the law by fishing in the first place and don't take any measures to avoid albatross deaths. These are thought to be responsible for the majority of albatross deaths. Other threats are collisions during flight with taught trawler cables which can break the birds wings. The answer is difficult as most of these deaths take place in the open ocean either not under the jurisdiction of any one country or of the waters of various countries meaning that international co-operation is needed to help conserve these iconic and magnificent birds. Protect the Wandering Albatross. 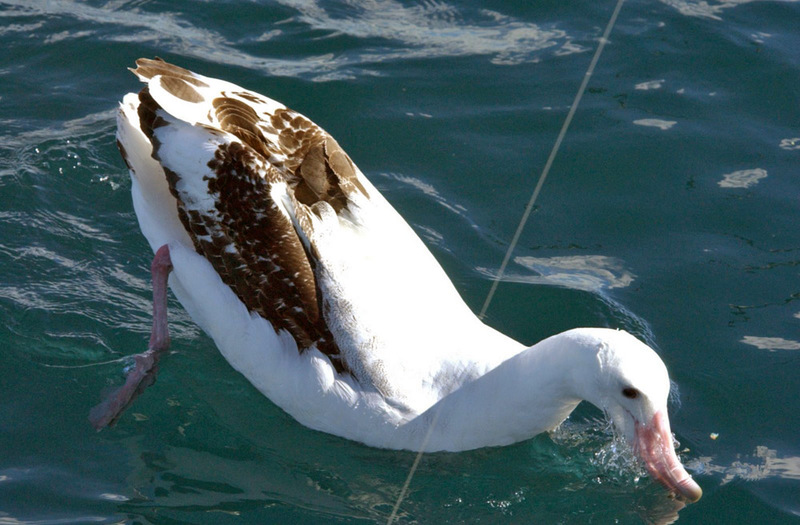 albatross are facing a decline due to illegal and unregulated longline fishing. Populations of Wandering Albatross are declining at an estimated 1% per year, exposing them to probable extinction within the century if nothing is done to protect them. "The bird that made the breeze to blow" - Samuel Taylor Coleridge from "The Rime of the Ancient Mariner". Copyright picture used by permission: Wandering Albatross flying over the South Atlantic and Wandering Albatross taking off - Liam Quinn from Canada, used under Creative Commons 2.0 Attribution Share and Share Alike generic license. / Albatross and line - NOAA.